The Capital Region continues to maintain a vast footprint of academic research and development space, and it is poised to get bigger with new construction projects underway at the University at Albany and Union College and another planned at SUNY Polytechnic Institute, according to a Center for Economic Growth (CEG) analysis of new data from the National Center for Science and Engineering Statistics (NCSES). In fiscal 2017, the region had 1.58 million square feet of R&D space spread across eight colleges and universities. That was a 1.7 percent decrease since NCSES’s last survey of university R&D space in fiscal 2015. 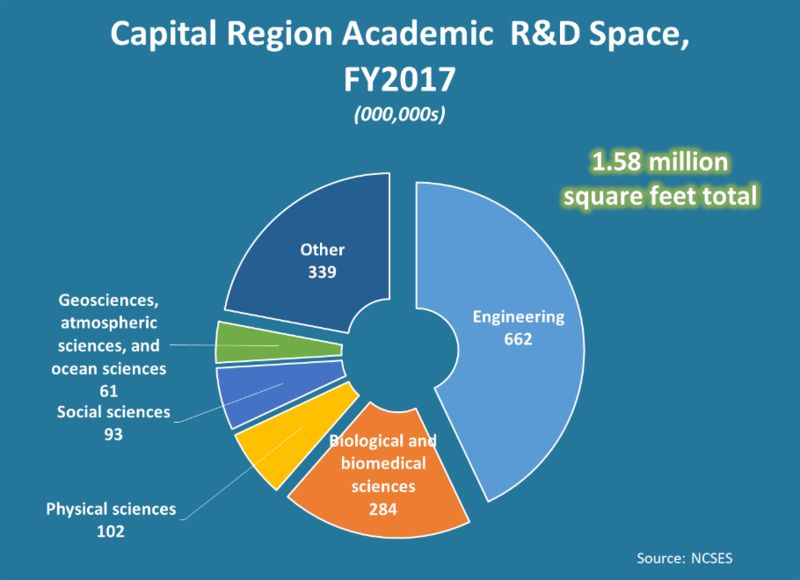 To maintain its position at the leading edge of research, the Capital Region is continuing to see new investment in R&D at its colleges and universities. For example, UAlbany is currently constructing 87,000 square feet of R&D space as part of the Emerging Technology and Entrepreneurship Complex (ETEC). Union is also constructing 23,000 square feet of R&D space for its Integrated Science and Engineering Complex. The $180 million ETEC is scheduled to open in 2020 and will house UAlbany’s College of Emergency Preparedness, Homeland Security and Cybersecurity as well as the New York State Mesonet, the nation’s most advanced weather-detection system. Union’s $100 million expansion and renovation of the Integrated Science and Engineering Complex represents the college’s largest and most ambitious project. The construction is expected to be completed by winter 2020 and Union will name the building after its former president: Stephen Charles Ainlay and Judith Gardner Ainlay Hall. Identify potential investors and providing venture pitch coaching through the VentureB series.